All the "Delete" and "Trash" links in WP admin are in red color with default text-decoration - underline. But, "Move to Trash" link in "Publish" metabox has text-decoration explicitly set to none. This is a minor inconsistency in terms of styling. I am attaching a patch for this. ticket#37018.patch​ (250 bytes) - added by monikarao 3 years ago. move to trash.png​ (14.7 KB) - added by monikarao 3 years ago. Fixed styling for "Move to Trash"
@monikarao Can you point to some of these links please? Thanks @monikarao there's an ongoing discussion about links, started with color contrast and touched also the underline see for example #35622. Worth noting, from an accessibility point of view, not all links must be underlined. For example the ones that are clearly perceivable as UI controls or menu items thanks to the context, don't need to be underlined. It's more a consistency issue across the whole admin and hopefully will be addressed as part of the colors revision effort. Related: #37969 where there's some consensus about adding the underline. These two tickets should be coordinated, since both need to change the submitdelete CSS class. Posting here the same screenshots used on #37969. Worth noting this change would apply to all the Publish meta boxes: posts, attachments, comments, old link manager (any other?). 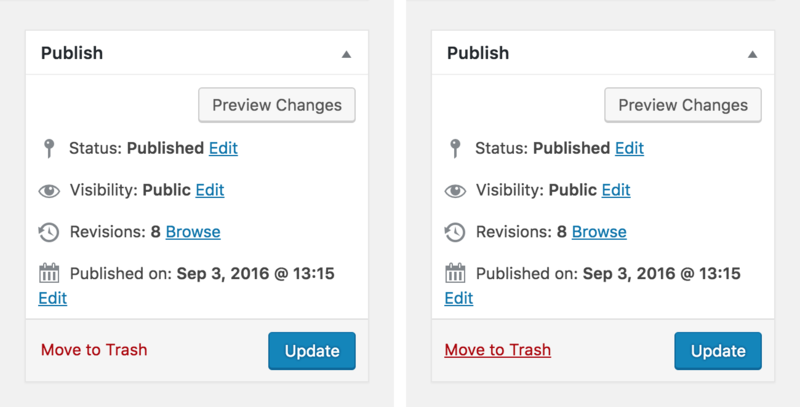 Accessibility: Standardize the remove/delete/cancel links in the Menus screen and Publish meta boxes. Props karmatosed, hugobaeta, monikarao, afercia. Fixes #37969, #37018. See #37448, #37138, #27314.